A homeowner loan – also known as a secured loan, home equity loan, second mortgage or second charge mortgage - enables you to borrow money against the value of your property. Borrowing in this way gives the lender additional security that you can cover the loan debt, because if you default on your repayments, they can repossess your home to settle the outstanding balance. It’s much lower risk for the lender, which means you can usually borrow more than you would do with a standard loan. Fixed for term: This means your repayments are set over the course of the loan, giving you predictability and stability throughout. Fixed rate short term: With this option, your repayments are fixed for a certain period, after which time they will increase to the lender’s variable rate. Variable rate: Repayments are pegged to the Bank of England base rate, which means if interest rates rise or fall, so will your payments. This is a riskier option, however if the base rate stays low, it could save you money. 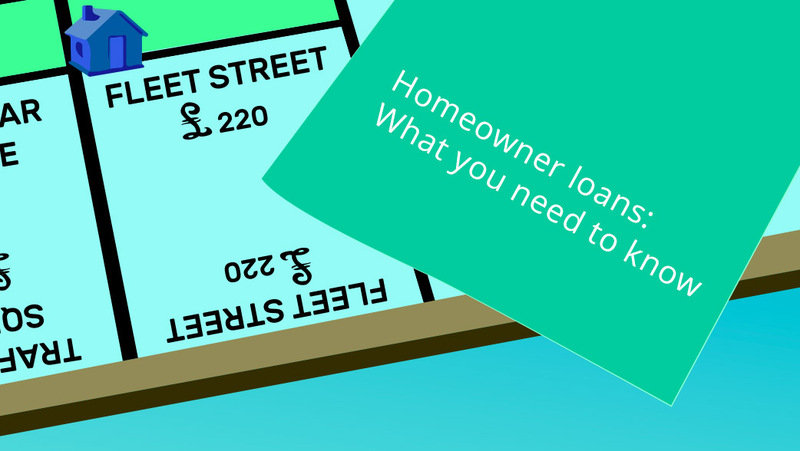 Who should consider a homeowner loan? Homeowner loans are good if you want to borrow more money than is possible with a standard loan, or if you have a poor or non-existent credit rating. However, bear in mind that the value of your property alone might not be enough, as lenders usually carry out additional affordability and credit checks, such as requesting proof of earnings. You also need to have sufficient equity in your property to cover the value of the loan, either because you’ve already repaid a chunk of it, or because your home has increased in value. Thanks to the security provided by your property, homeowner loans can be much larger than standard personal loans - usually from £15,000 and as high as £2m. However, the amount you can personally borrow depends on various factors, including your credit rating, salary, existing credit commitments, the value of your home and the level of equity in your property. Lenders usually set a maximum loan to value (LTV) percentage that they are willing to lend you, similar to how it works with a mortgage. This varies between lenders however it can be as high as 95%. To give an example, if your property is worth £400,000 with a remaining mortgage of £240,000, then you have £160,000 of equity to work with. So, if you wanted to borrow £120,000, the LTV would be 75%. Can the lender really dispossess your property? In a word, yes. However, that is the last resort, as it usually means the lender will also take a hit on their profits from the loan. As an alternative, they may give you the option to arrange a new schedule of payments or take a repayment holiday. Obviously neither is ideal, so ensure you only commit to a loan you can afford. It’s more than just your credit rating at stake with a homeowner loan, so you should think carefully about what you can afford before committing. You can look at affordability in two ways – as the monthly payment, or the overall value that you’ll pay back. Lower monthly payments may be tempting, but that means you’ll be paying interest for longer, so the total amount you pay back will be higher. You should therefore look to strike a balance between the two. Terms for homeowner loans are usually between five and 25 years. Read the paperwork carefully and watch out for any hidden charges, such as arrangement fees, valuation, broker and legal fees, early repayment penalties or charges for same-day transfers. You may be offered the option of a repayment holiday, which can be a useful safety net in lean times, enabling you to take a break from your repayments. However, be aware that interest will continue to accrue during this time, so you will end up paying more as a result. Some lenders will also try to get you through the door by offering headline grabbing interest rates. These can be tempting but they are usually only open to a certain number of customers, so you may be in for a surprise when you’re offered a higher rate following your application. Get in there early to have the best chance with special offers. Another thing to think about is if you’re planning to move house in the near future. If so, check with the lender what your options would be. Sometimes you can transfer the loan to your new property, pay the loan off with the funds from the sale, or potentially borrow more money to settle it. But it can certainly complicate things, so check this before signing on the dotted line. Homeowner loans can be useful way of accessing the value in your home, to cover important costs and outgoings in the short-term. But taking out this kind of debt isn’t without its risks, so ensure you do your research, choose a reputable lender and think carefully about what you can afford before signing up. Our mortgage leaderboard puts the Newbury, Vernon and Darlington building societies on top overall - followed closely behind by Halifax and Nationwide. Discover what consumers like you have to say about their lenders.